Here at Magnum Contracting Group, our team of Greenvale roofing contractors are proud to serve both residential homeowners and commercial business owners with all of their roofing needs. Over our years of service to the local area, we have established ourselves as the premier roofing company in the Greenvale area, and it is an honor that we do not take lightly. In every service we provide to our customers, we strive to make sure that our customers needs and goals are put at the forefront and that one of our main concerns is helping our customers add long-term value to their homes. If you are looking for the best roofing contractors in the Greenvale area, then look no further than the professionals at Magnum Contracting Group. Our team of fully licensed professionals will bring a level of dedication and a standard of quality to your next roofing service that is second to none. Our dedication to excellence is part of why our customers trust only us to handle all of their roofing needs, and they know that after their service is finished, they will have exactly the results they were looking for. We stand behind the quality of our work 100%, and our team of polite and courteous staff are always happy to discuss any questions you may have about our services. Give us a call today, and schedule your appointment. Your roof is your main line of defense against unpleasant temperatures and rough weather, which makes it extremely important to keep that line of defense strong. If the waterproof barrier of your roof is compromised, the resulting water damage can very quickly turn into a nightmare, costing you potentially thousands of dollars in additional damages. When you notice anything wrong with your roof, it is extremely important to call the professionals in right away. Our team of Greenvale roofing contractors at Magnum Contracting Group are equipped to handle both routine maintenance and emergency repairs to your home's roof. During our roof inspections, we can help you identify any small problems that could become something larger if they are left to go on unchecked. In addition, through our insurance restoration services, we are able to handle any emergency repairs to your roof in both a timely and effective fashion, letting you get back to your normal life as quickly as possible. 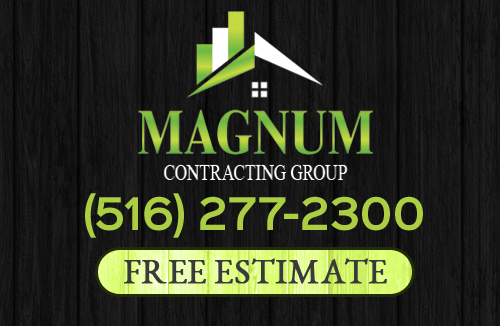 If you are looking for a professional Greenvale roofing contractor, give the pros at Magnum Contracting Group a call today at 516-277-2300 or complete our online request form.